Toucan Hostel Budapest i Budapest, Ungarn: Bestill nå! 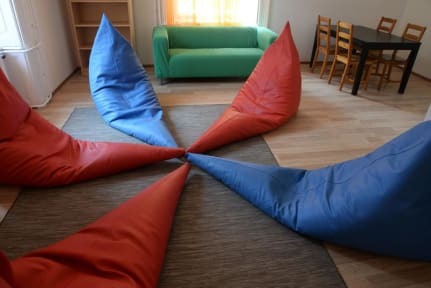 Toucan Hostel Budapest offers comfortable lodging in the heart of Budapest, in the Jewish district. Affordable prices, clean and cozy rooms with chilled atmosphere - a place to retreat from the noise of the party district below. We welcome our guests on the corner of Rakoczi and Kazinczy str. right above the most frequented area of Budapest's nightlife. Our friendly receptionists will help you have a great time visiting the city by giving you in-depth guidance about arts and entertainment, leisure and recreation, tours, trips, food and drinks. We are located in the geographic middle of central Budapest. On the corner of Kazinczy and Rakoczi str., halfway between Astoria and Blaha Lujza sqr, this is an ideal spot for walking, biking or even shipping. Both boulevards are 5 minutes away, which places the Hungarian National Museum, St. Stephen's Basilica and the legendary Vittula pub in the neighborhood. We are along the main bus lines (5, 8E, 7, 178) and a couple of corners from the most frequented tramlines (4, 6, 47, 48, 49). Toucan Hostel provides twin rooms and 4-8 bedded dormitories. All our rooms are equipped with showers and toilets for the highest privacy. The beds are mostly comfortable bunk beds. The kitchen is fully equipped, so you and your friends can store and cook your own food. We offer free tea, coffee. What we offer: 24 h reception; Wi-Fi; free towels; free coffee / tea; fully equipped guest kitchen; hair driers to borrow; security safe at the reception; private bathrooms; private lockers; laundry facility (€15). The rooms were alright, but they were incredibly hot. They have laundry, which we thought was nice, until staff ran our nice blouses and such on 90c program, right after we asked which one was the 40c one. The clothes were however not thoroughly clean, and they did not dry even after hanging them up for a long while due to the humidity and warmth of the room. Additionally they did not have towels nor hand soap in the room nor for sale/rent. Their response was “this is a hostel” when asked.